It's not often that you can feel really good about a hike, I mean beyond the usual excitement over being in the woods, getting exercise, and catching some of the most incredible views in the universe. But this time, this hike, meant more than our usual trek through the wilderness. This time we had the opportunity to hike for someone else. For 3,056 people actually. After a crazy summer in which Chris has been adjusting to life as a father, and in which Rob has adjusted to living in MA, there has been little to no time for hiking. 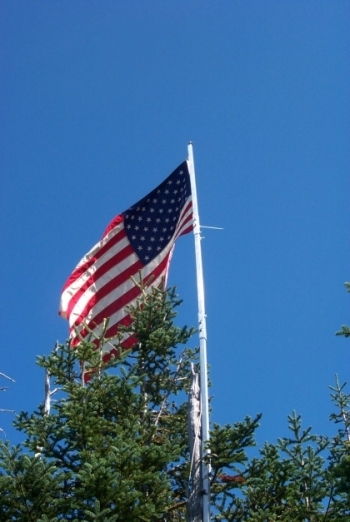 But when the time came for volunteers to join the group hiking American flags up all 48 4,000 footers in NH, we couldn't resist. After choosing Mt. Zealand (somewhat randomly), Rob set to work building a complex flag pole and Chris set to looking for others to join the hike, planning for camping (we needed to be at the summit by noon), and getting provisions. After convincing Dome and his brother Pete to join us, we planned our route up the Zealand Trail and Twinway up to the summit. Although the summit is occluded, we knew we could build a flagpole that would work with a tree to get Old Glory above the tree line. We camped out at Sugarloaf II, a campground just off Zealand road (is everything named Zealand around here?) on Friday night in Dome's new popup trailer. After a healthy breakfast Saturday morning, the four of us (plus the two dogs, Kaia and Bailey) headed to the trailhead to get under way. The parking lot at the trailhead was VERY crowded, presumably because this lot supported the Zealand hut. This was proved to be a good theory as we saw few people on the trail, and those we did see came from the hut. The Zealand Trail starts out very amiably with a low grade, good footing and plenty of width. This typical of trails that follow old railroad grades as this one does. There's not much to see in the first 1� miles except for forest and a few streams. The grade stayed flat all the way to the Zealand Ponds, where we finally found some very nice views. Mt. Tom and Mt. Field are both visable from the ponds, and give you a taste of what's in store later. A couple footbridges were constructed, making the trip here very comfortable - in fact most of the trail was quite easy to travel. Of course, if you ask Bailey, the bridges are very slippery (or maybe Pete really did push him!). 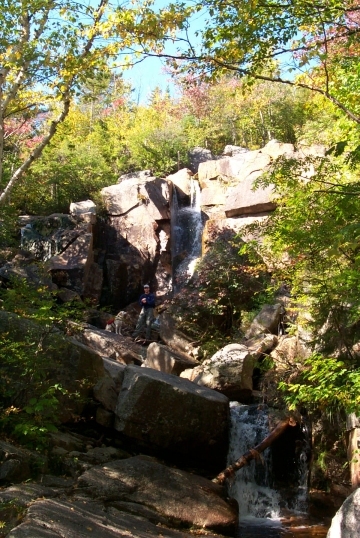 At about 2.5 miles, the Zealand Trail turns into the Twinway Trail (part of the AT) and starts its ascent. The trail is still fairly wide and easy to travel. After about 5 minutes, on the left hand side of the trail, you will see a sign for the Zealand Falls. I recommend taking this 25-foot detour, as the falls are beautiful. We took a few minutes here and let the dogs get some water and play, then we packed up our things and headed back to the trail. We didn't have to hike long before we heard voices from the Zealand Hut (2.7 miles). As we approached the hut, we could hear these voices, but couldn't see what was ahead. The approach is sudden, and you seem to walk out of the woods and just arrive at the hut. You can't see it until you're on top of it. That was ok though, because it's fun to walk out of the woods and happen upon the site of the hut, and the views that accompany it. The Zealand hut is quite nice, resting on a hillside with a medium sized stream running beside it. The hut is fairly large, accommodating 36 people year round. The views out the front of the hut are spectacular, as well as from the stream next to the hut. Getting here was fairly easy, as the ascent to this hut is only about 700 vertical feet up from the elevation of the parking lot. 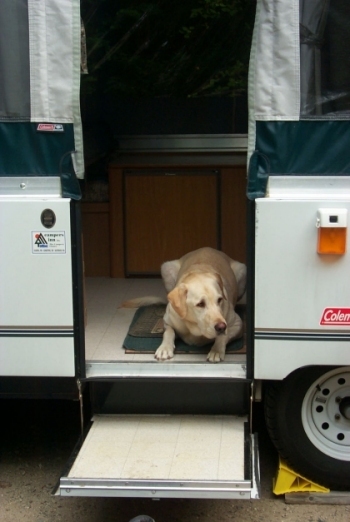 Because of Kaia, our loud-mouthed companion, we only stayed at the hut for a few minutes. After taking in the views, we were sort of anxious to get moving again, so we plugged on. The trail continues from the Zealand hut at about the same grade (about 30�) and stays fairly wide. Before too long, we heard a strange sound that we couldn't quite identify. About 100 yards away from the hut we discovered the noise came from a pump that drew water from the Whitewall Brook and piped it down to the hut. From there, we moved on and followed the trail up. 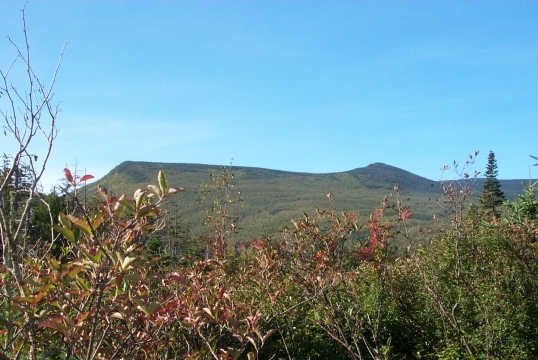 At about 3.7 miles, the trail levels off and you think you may have reached a summit. Well, you do, but not the summit you wish you had reached! There is a very small sign that says simply, "View" on the left of the trail. By all means, TAKE THIS DETOUR. 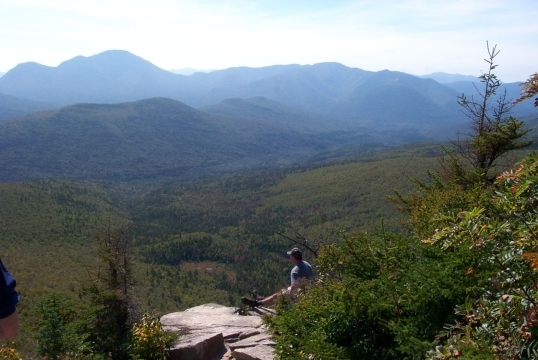 It offers one of the finest views in all of the White Mountains from a cliff called the Zeacliff. And although it is likely to be crowded, it is certainly worth sharing with others. From the Zeacliff, we could see Mt. Carrigain, Mt. Hancock, and some smaller peaks. After a lengthy rest, we moved on across the "peak" we had reached toward the peak of Mt. Zealand. We were fooled into thinking that we could see the summit, as it looks like you approach the end of the hike as you traverse this plateau. We found out soon that this was definitely not the case, and was not the last time we would make this mistake. The plateau ended and we began our ascent again at about 4.1 miles. The grade here got a little steeper and more difficult, but was still easily passable. Kaia and Bailey started to show the first signs of fatigue; although for them fatigue is not running 100 yards ahead, running back, then running 100 yards ahead again. 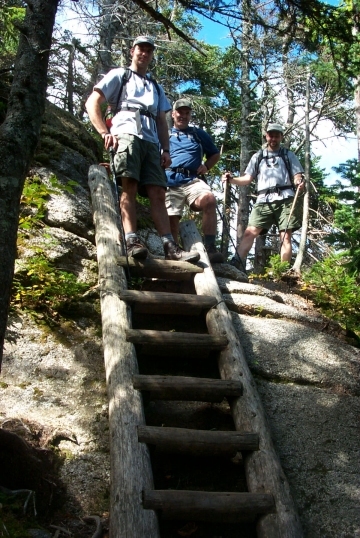 At one point on this section of the trail, there is a ladder built into the trail to assist because the terrain is too difficult to traverse. After we got through this section, we arrived at a magnificent, albeit crowded view. Now, this could happen to anyone, really. We were tired, it was a great view, we wanted to rest, etc. We thought we were at the summit at this point. Although Chris was fairly certain that the summit had a sign that said Zealand on it (duh). So we started to unpack our things and figure out where to put the flag. But an uneasy feeling nagged at us about this one. We kept checking our map (a 1:24,000 out of the WMG) to see if we were really at the summit. After a short chat with a few other hikers, we decided we weren't actually at the summit. So we moved on. The rest of the trip up to the true summit of Zealand is pretty uneventful, and it doesn't come easy. Our legs began to show wear here, and the thought of the summit kept us moving. Around 12:15 PM (a little late) we made the peak. It was very well occluded and tight. We unpacked the gear, hoisted Old Glory and enjoyed some of the sunshine. Before too long, Dome and Pete got bored with the viewless summit and headed back to the ledge where there was something to see. Chris and Rob kept the flag flying, and when it was time to go, we packed up and went to find Pete and Dome. Feeling rested, we all headed back for the parking area. We couldn't resist another stop at the Zeacliff, but it was very crowded by this time and the dogs were trying to eat the cute high school girls resting there. We moved on down the trail, and aside from Kaia nearly giving some poor lady a heart attack near the Zealand hut, and Chris breaking his elbow when he slipped off a rock, the descent was pretty humdrum. By the end of the hike, Bailey needed to be lifted into the Durango, and the rest of us were not far behind. We were proud to take part in the Flags on the 48 hike, and we'll participate again next year. The event was honorable, and we would like to see more of our friends and neighbors taking part. If you would like more information on the Flags on the 48 event, go to http://www.flagsonthe48.org.